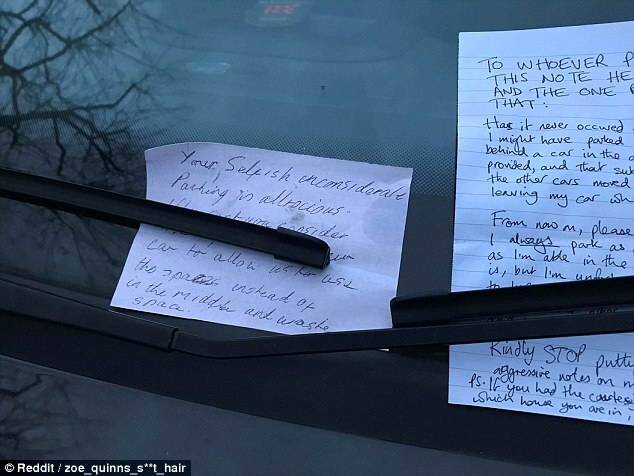 The pressure to find a decent space for the car has sparked an escalating war of passive aggressive parking notes between two London neighbours. 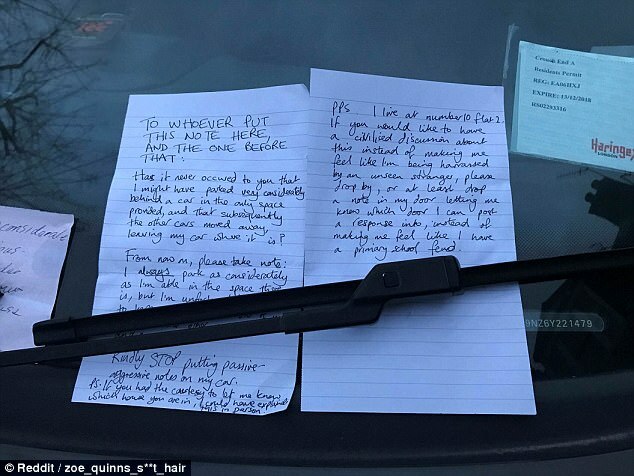 The angry driver looking for a place to park in Haringey was moved to take action when he found that his neighbour had parked over two spaces. He went on to accuse the other driver of parking in the middle of two bays and “wasting space”. In an image posted , the accused responded in an equally passive aggressive manner. The owner of the parked car wrote: “To whoever put the note here and the one before that, has it ever occurred to you that I might have parked very considerately behind a car in the only space provided, and that subsequently the other cars moved away leaving my car where it was? "From now on, please take note: I always park as considerately as I am able to in the space there is." He continued: “Kindly stop putting passive aggressive notes on my car. "PS. If you had the courtesy to let me know which house you are in, I could have explained this in person. He went on to say that he would gladly talk to whoever left the note and left his address for them to take up the issue with him in person. "If you would like to have a civilised discussion about this instead of making me feel like I am being harassed by an unseen stranger, please drop by, or at least drop a note in my door letting me know which door I can post a response into, instead of making me feel like I have a primary school feud," he wrote. Ian Crowder, a spokesman for the AA said that arguments over parking were becoming an increasing occurrence as roads become more congested. He said that one of the most common places where tensions run high is in busy supermarkets and pointed out that as the roads get busier the problem is only going to worsen. “Everybody is in the same boat and as the roads are becoming increasingly congested there is no excuse for this kind of behaviour it really is important for drivers to remain considerate,” he said.